I am absolutely in love with this phone&apos;s design. That pop-up cameras work smoothly although I am pretty afraid of breaking it. Also, I did get a lot of compliment on the gradient back design which is attractive af. According to me, this phone is priced perfectly and pop up camera makes it a good choice. I went ahead and bought this and I am totally satisfied with my decision. 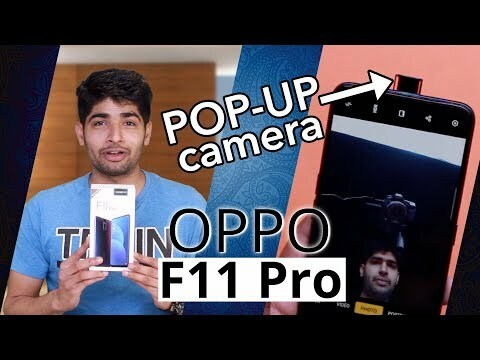 If you want to taste the popup cameras without spending heavy money, then Oppo F11 pro is a good choice. The phone does have very impressive cameras which for me is always a good thing. The gradient back looks so fantastic and you will definitely love the design. Everything about this device is good except the software. I wanted to taste the pop-up camera feature so I decided to buy this phone. I am 50% happy and 50% unsatisfied with this phone. I liked the premium feel, superb design, popup cameras and thin profile. But on the other hand, the phone lags a little bit, UI is not that clean and is filled with useless apps. 3 Pricebaba users have written their experience with Oppo F11 Pro. If you own Oppo F11 Pro, please do leave your feedback too. Lowest price of Oppo F11 Pro price in India starts at Rs. 24,449 Oppo F11 Pro is available on Amazon at Rs. 24,449. Prices updated on 19th April 2019. The Oppo F11 Pro is a flagship smartphone launched by Oppo. The device comes with all the latest feature and some of the exclusive offerings making Oppo the first to feature those. The smartphone comes with unique camera perks and is capable of doing advanced level photography. It also comes with all flagship features and is ideal for people who love to get engaged with cameras and do multitasking. The Oppo F11 Pro looks gorgeous when viewed via different angles as the back shifts colours. Not only looks, but the metal frame also gives it a solid build quality extending the durability of the handset. The front of the smartphone shines a stunning and a large 6.5-inch IPS LCD capacitive touchscreen display with a resolution of 1,080 x 2,340 pixels and a high 396 PPI density. Thanks to the bezel-less display that the smartphone doesn't look like a giant in size despite the large screen size. The display also comes with a punch hole design that carries the front camera. To power all these, the handset has a massive 4,500mAh Li-ion battery supporting Oppo’s VOOC charge technology that charges the device with blazing speed. The camera being the main highlight of the phone is a 16MP + 20MP dual primary camera setup that performs like a pro at every arena and supports 10X optical zoom, the feature about which the company had been marketing for months. The front camera is also a 25MP + 16MP dual camera setup and is capable of shooting excellent selfies with AI backed tweaks. The Oppo F11 Pro is powered by Qualcomm Snapdragon 855 octa-core processor coupled with 6GB of RAM that makes the smartphone perform like a beast and handles everything with ease. The chipset also comes with Adreno 640 GPU to run big games with best graphics settings. The device runs Google's Android 9.0 (Pie) with Oppo's own Color OS customization offering some degree of flexibility in doing a few things. Thankfully, the Oppo F11 Pro retains a 3.5 mm headphone jack along with active noise cancellation microphone. It also carries all necessary sensors like a fingerprint sensor, light sensor, proximity sensor, accelerometer, and gyroscope.